It seems that A and C have done a lot of catering (or at least cooking with others) recently but last weekend A and C were treated to a meal with new Kiwi friends J and L. Neither A nor C had to touch a thing - a treat in itself - but doubly so when the food that J and L produced was as good as it was. We know that L in particular was worried about us blogging about her 'simple Sunday lunch', but what was produced was so good it deserves to have its praises sung. 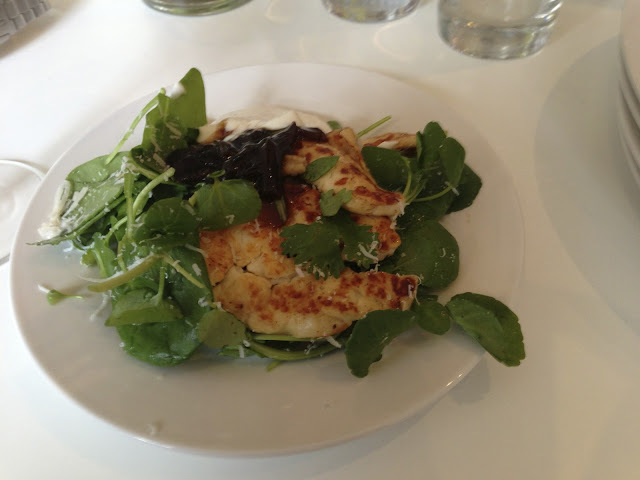 J and L know about the blog, and L also knows we have a bit of a thing for Middle Eastern food. As they live in an area of North London which is full of Greek Cypriot and Turkish shops, they decided to make the most of the local delis and rustle up some stuff from the eastern Med. 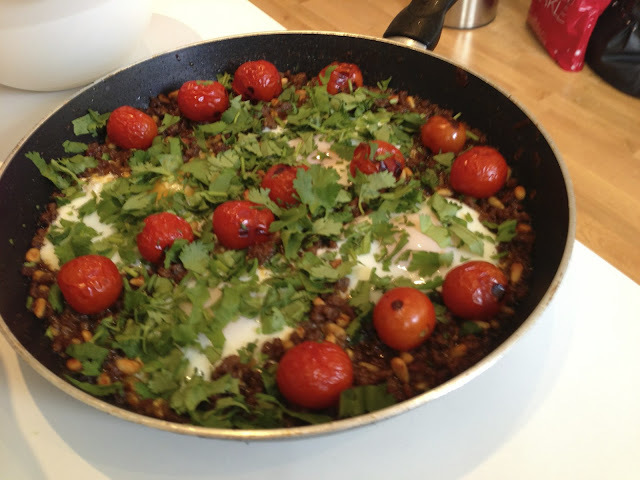 The main event was an Ottolenghi recipe from his Jerusalem cook book, starring lamb mince, pine nuts, spices, baked eggs and tomatoes. This kind of thing is right up A and C's street, and while we don't own any Ottolenghi cook books, C is avidly following his current TV series on Channel 4. For those of you who have never really experienced Ottolenghi food, it's a delight. The presentation and method of cooking is often fairly rustic - Yotam and Sami aren't into fancy reductions or fiddly decorations - but the flavours are always interesting and intense. Moreover, the food is often a riot of colour, using the fruits, vegetables and spices of the Near East to maximum effect. J and L's lamb was a perfect example of this: deep reds and greens shone out from among the two-tone browns of the lamb and pine nuts, making for a very attractive pan, which was brought to the table. 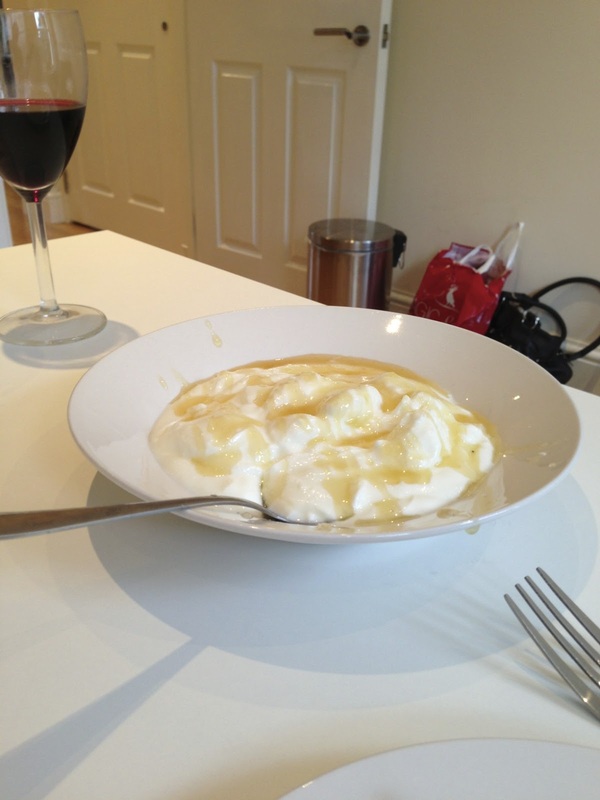 The dish was garnished with coriander, sumac and a drizzle of sour yoghurt, combining tahini, natural yoghurt and lemon juice. 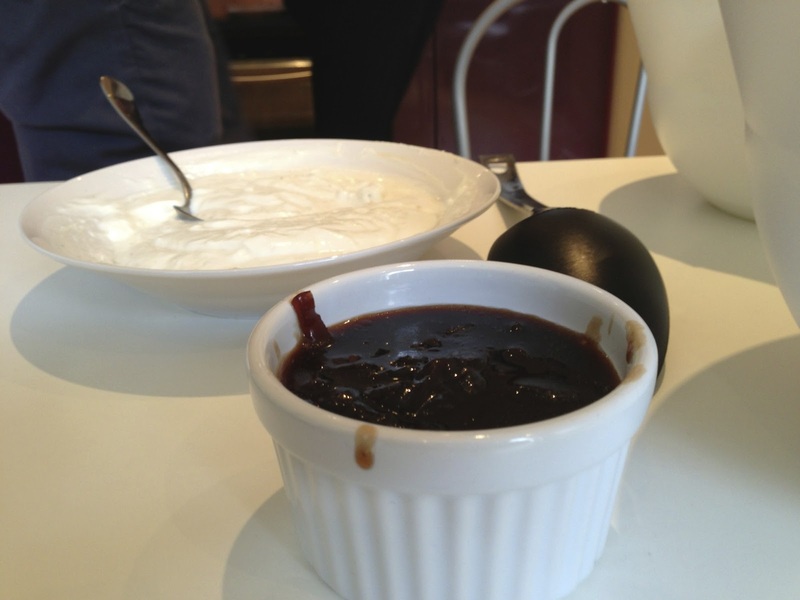 A absolutely loves cooking with tahini: it's bitter on its own, but sesame paste can add a wonderful depth of flavour to lots of things, and is one of the ingredients that gives Levantine food its distinctive taste and texture. Sumac is another one of these quintessentially Middle Eastern flavours, and the yoghurt and sumac combo left the dish tasting very authentic indeed! The lamb was accompanied by a delicious side dish of grilled halloumi and lambs tongue lettuce salad, garnished with a home-made caramelised onion relish. Once again, the flavours were fantastic. 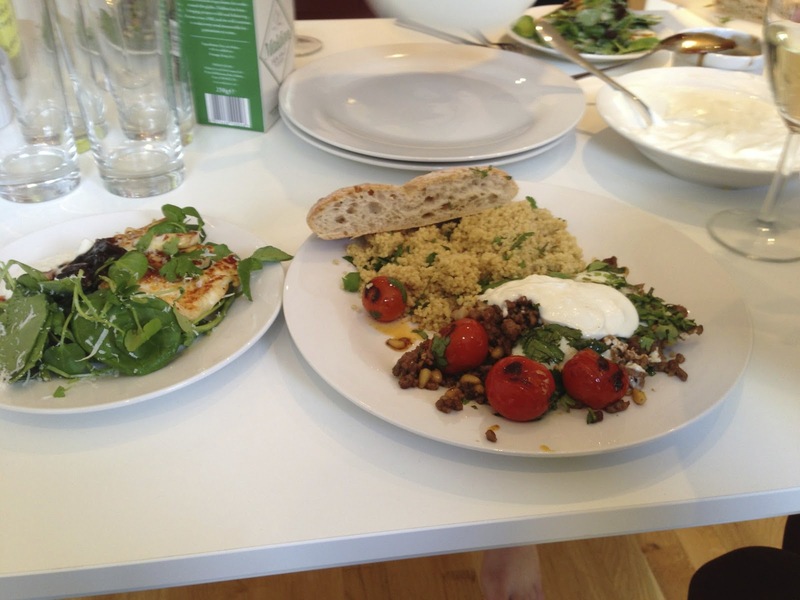 A and C are huge fans of halloumi and J and L had cooked it to perfection. There is always a risk of over-cooking this cheese: halloumi can go rubbery and squeak between your teeth as you chew, but this pitfall had been skillfully avoided. The cheese was warm and literally melted in the mouth. This was complemented by the crunch of the fresh leaves, and the saltiness of the cheese contrasted strongly with the sweetness of the relish. In case that wasn't enough, J and L had made some bulgur wheat, which they'd cut with a variety of spices. The result was that when lunch was served, the plate was a riot of colour and texture, which looked absolutely brilliant. The main course didn't last very long, as all four of us immediately got stuck in. J and L were also right on the money with the dessert: they adapted a Delia recipe for lemon tart. C was satisfied with the tart in the lemon department - in contrast to Cigalon - though L pointed out that it was maybe a little too sour for some. Like the main however, it lasted barely a few minutes as each of us had firsts and promptly returned for seconds. 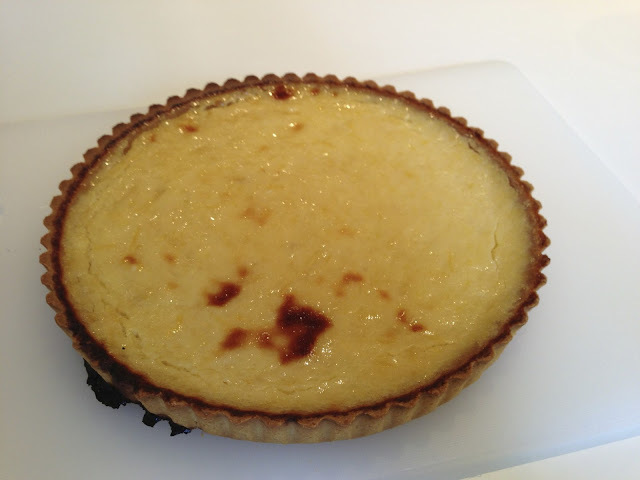 J and L had in fact made two identical tarts; while our eyes said yes, our stomachs said no and in the end our better judgement won out over our latent gluttony (we left L to take the tart into work, where apparently it didn't last the morning!). J and L are relatively new friends and happily, we discovered over lunch that they're foodies in much the same vein as us. We spent a good while lounging around J and L's flat talking about food, travel and politics. We also got so far as to plan a couple of further culinary adventures together: a return dinner party leg at A's flat in the Docklands and an adventure to Pitt Cue Co - both of which A and C are looking forward to and will no doubt blog about. We had thought about going to Hampstead Village to stroke the reindeer, get charity mugged by A's parents and drink some mulled wine (there was some kind of Crimbo event going on) but as afternoon turned to evening, we'd spent so much time chatting we'd missed the whole thing. We left full, a little sozzled and very grateful to J and L for their brilliant hospitality and spread. We're going to have to get our thinking caps on for when J and L trundle down to the Docklands in the near future...The pressure's on!